"'All shrikes are bullies, aggressive and blood-thirsty', says a distinguished naturalist, and the habits of the African helmet or wood shrike would seem to confirm this statement. 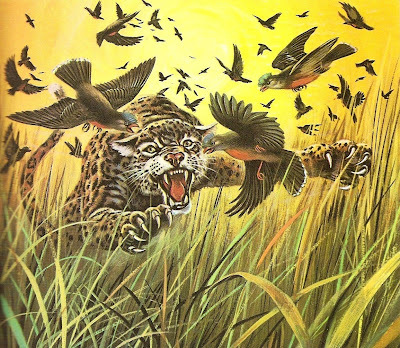 But like other creatures, including man, it must eat to live, and fight for its living. We hear of shrikes seizing helpless young birds and pecking out their brains to provide a tasty morsel, whilst ignoring the rest of the body.... In many districts shrikes band together in companies to protect their nesting grounds. Fortified by numbers they become exceedingly daring, and will even mob and 'dive buzz' an invader as large and formidable as a leopard." 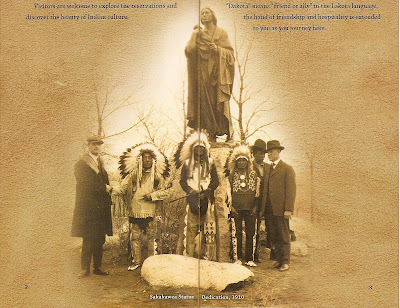 North Dakota Tourism Division 28-page brochure entitled "Indian People of North Dakota"
photo caption: "Sakakawea Statue Dedication, 1910"
"Visitors are welcome to explore the reservations and discover the beauty of Indian culture. "The native people of North Dakota invite you to 'Indian Country.' When Meriwether Lewis and William Clark set out to explore the Louisiana Purchase west of the Mississippi River, they found it occupied by Native peoples who had developed extensive trade networks from the Northwest Coast, to Mexico, and into what is now Canada. Walk in the footsteps of some of the legends of American history, like Sakakawea and Sitting Bull, and take in the beauty of their homelands. Just as the name 'Dakota' means 'friend or ally' in the Lakota language, the hand of friendship and hospitality is extended to you as you journey here." 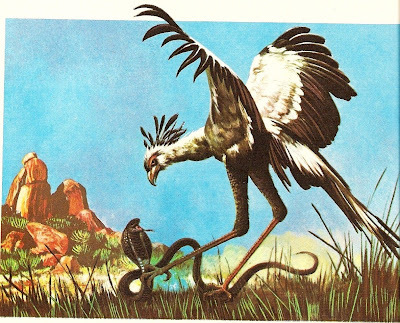 "When the secretary bird comes calling, even the deadliest snake had better hide, for this odd-looking creature is a master of the fine art of killing snakes. Found throughout the African grasslands from the Egyptian Sudan to Cape Province, the secretary gets its name from the crest of long feathers that look like old-fashioned quill pens stuck behind its ears. Most of its four-foot height is taken up with the long, gangling legs that allow it to walk faster than a man can run. When it spies a snake, it approaches, weaving and flapping its wings. By confusing the aim of the reptile's fangs, it can pin the writhing serpent with one powerful foot. Then, seizing its victim behind the head, it either dashes it to death or takes it aloft and kills it by dropping it from a great height to the hard ground below." 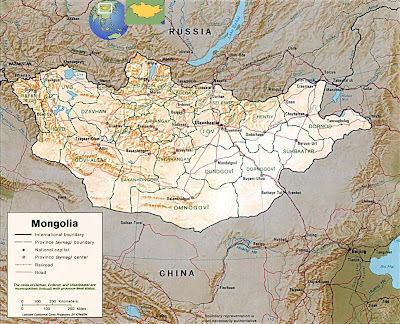 "Several stories imply that sucking of blood has occurred. Because of this, revenants have sometimes been described as 'vampires' by a number of authors of popular books about vampire legends, starting with Montague Summers. Medievalists are, however, largely skeptical towards this interpretation, possibly because vampire legends are believed to have originated in Eastern European folklore and became known to the Western public only later through reports coming from the East in the 18th century. Vampires do not appear in Western fiction (with modifications) until the late 18th century and early 19th century, starting with authors such as Robert Southey, Lord Byron and John William Polidori. However, anthropologists and folklorists tend to blur distinctions between the various forms of 'walking dead', for which counterparts exist in the myths and legends of nearly every civilization dating back to earliest history." "Stories are often told of eagles carrying off a lamb or child, but real-life instances capable of proof are very few. It is generally agreed by ornithologists that an eagle is unable to carry a weight in excess of its own, and few of these birds weigh more than twelve pounds. 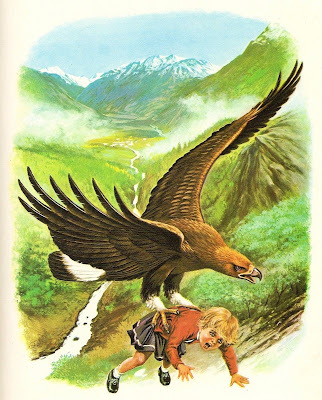 However, there seems no reason to doubt the terrifying experience of four-year-old Svenhild Hansen, who was actually 'kidnapped' by an eagle near Trondheim in Norway in June, 1932. She was playing in the yard of her parents' farmhouse when an eagle swooped down on her, fortunately clutching only her dress in its talons. The giant bird is then said to have carried her 'more than a mile' towards its eyrie. Becoming tired, it deposited her on a ledge eight hundred feet up on a mountain and fifty feet short of the nest. Only the fact that the eagle was seen to fly repeatedly over the spot gave a clue to the panic-stricken parents and a party of searchers. Eventually little Svenhild was found there fast asleep, uninjured except for slight bruising and a few scratches. "Now a married woman, she keeps the torn frock she then wore as a souvenir of one of the world's most amazing adventures. As it is the habit of eagles to kill their prey before bringing it to the nest, Svenhild's escape must be one of the most extraordinary on record." "In the Julian Calendar as well as in the Gregorian Calendar that improved it, intercalation is done by adding an extra day to February in each leap year. In the Julian Calendar this was done every four years. In the Gregorian calendar, years whose number is evenly divisible by 100 but not 400 were exempted in order to improve accuracy. Thus, 2000 was the first century year in 400 years to be a leap year." "Soteriology is the branch of theology that deals with salvation. It is derived from the Greek sōtērion 'salvation' (from sōtēr 'savior, preserver') + English -logy. The term itself can be used to refer to any kind of religion, and no savior figure or figures are required. Soteriology is a key factor that distinguishes religion from philosophy." "She asked him why did he not write out his thoughts. For what, he asked her, with careful scorn. To compete with phrasemongers, incapable of thinking consecutively for sixty seconds? To submit himself to the criticisms of an obtuse middle class which entrusted its morality to policemen and its fine arts to impresarios?" "Besides, it happens fast for some people and slow for some, accidents or gravity, but we all end up mutilated. Most women know this feeling of being more and more invisible everyday." "Californians are a race of people; they are not merely inhabitants of a State." My friend Mike and I have a 14-year ongoing dispute over religion. He's atheist; I'm agnostic. I visited Mike in Boston last autumn. I arrived late on a Saturday night, and as we rode through the city in a taxi, Mike told me that he had to get up early the next morning to attend the weekly meeting of his atheist group. I said, "What?" He told me, yes, he's a member of an atheist group that meets every week, and I was invited to come along. I said, "You go to church? You're an atheist! The best part about being atheist is that you don't have to get up on Sunday morning and go to church! So you blow that all to hell by going to atheist church? Whoever heard of such a thing? And you want me to go with you? Goddamnit Mike, of all the people I know, you were the last person I ever expected to push their religion on me." But I went; the atheists met in a bar so at least we got to drink. "'The Raven' is probably the best-known poem in America. When it appeared in the New York Evening Mirror for January 29, 1845, it created a national, even an international, sensation. 'No brief poem,' says George E. Woodberry, 'ever established itself so immediately, so widely, and so imperishably in men's minds.'" "Studying the brain behavior leading up to the moment of conscious decision, the researchers identified signals that let them know when the students had decided to move 10 seconds or so before the students knew it themselves. About 70% of the time, the researchers could also predict which button the students would push. "Dutch researchers led by psychologist Ap Dijksterhuis at the University of Amsterdam recently found that people struggling to make relatively complicated consumer choices -- which car to buy, apartment to rent or vacation to take -- appeared to make sounder decisions when they were distracted and unable to focus consciously on the problem. "Moreover, the more factors to be considered in a decision, the more likely the unconscious brain handled it all better, they reported in the peer-reviewed journal Science in 2006. 'The idea that conscious deliberation before making a decision is always good is simply one of those illusions consciousness creates for us,' Dr. Dijksterhuis said." "Mr. Oakhurst seldom troubled himself with sentiment, still less with propriety; but he had a vague idea that the situation was not fortunate." "In certain natures the deepest joy has always something of melancholy in it, a presentiment, a fleeting sadness, a feeling without a name."